A Peek Into Our Team Retreat • Ojai Vista Farm — To Be Magnetic™ | Manifest the life you deserve for less than a dollar a day. As some of you may have followed last month, the FN team had the absolute pleasure of spending our first ever team retreat at Ojai Vista Farm in Ojai, CA. It was beyond what we could have imagined! Beautiful homestead on a working organic farm, stunning views, creative inspiration seeping from every corner and endless, very much enjoyed team bonding over home-cooked kitchari and Chaga prosecco. Cheers! We were inspired to embark on our team retreat with the desire to bring our small team, which is spread from west coast to east coast, together for the first time. We wanted to escape from the busyness of every day and connect, brainstorm creative ideas to grow and support Free and Native together. 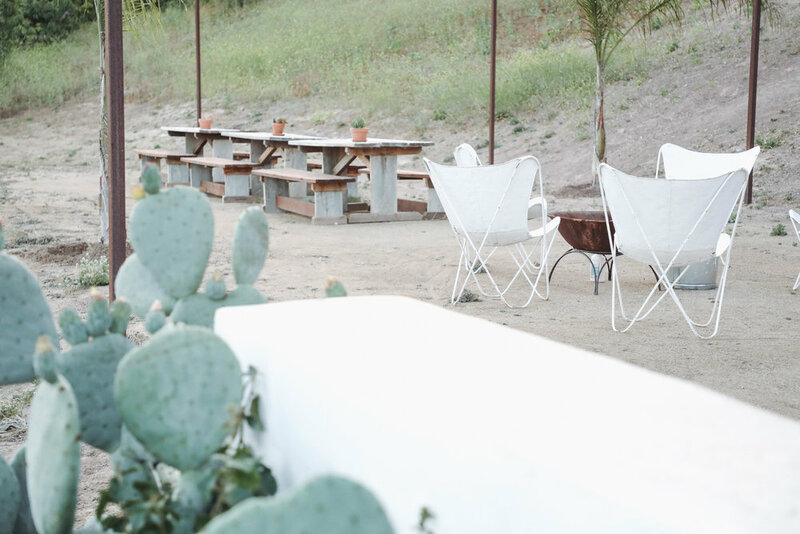 Ojai Vista Farm provided us with the most idyllic secluded haven for our vision to come true! We took advantage of every nook we could find – we even sprawled out halfway down the hill on a small clearing to sink into a team DI. Our retreat began after swooping up our out-of-town team members from the airport in LA. We made our way up the beautiful coast of SoCal, stopping only to refuel with smoothies and to grab a few groceries. 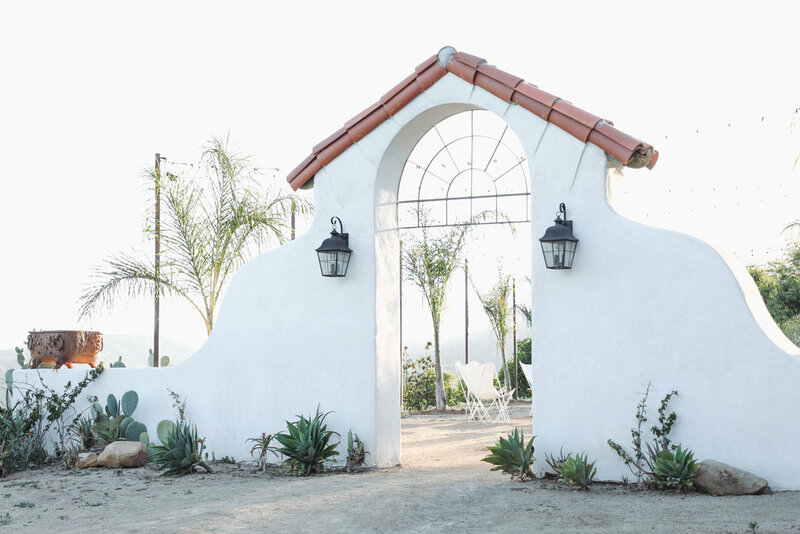 We slowed through the winding rustic roads of Ojai until we reached the gates to Ojai Vista Farm. Windows down, we inched our way up the driveway lined with avocado trees, cacti and a lizard or two. The main house rests at the very top, overlooking the surrounding hills and valleys. It peeks over the other offerings of the land: the vineyard, orange and olive groves, herb garden, and open spaces. We instantly made ourselves at home, spreading out and claiming our desired beds. The home comfortably sleeps 6-8 people. Plenty of space for a small or large party. Each bed is outfitted in Parachute Homes eco-friendly bedding and the bathrooms are all stocked with only organic, eco-friendly products. It would be too easy to sink into the bed or bath for the entire stay if it weren’t for such a visual feast outdoors. Once settled, we all headed straight for the pool (not without first grabbing a freshly picked orange from the bowl in the foyer). The saltwater pool was our escape from the heat of the high sun. It’s right off the main house, as well as a hot tub and pool deck with reclining chairs where we spent the better half of our afternoons with fruit juice trickling down our wrists, ideating, storytelling and discussing blocks we’re currently working through. When our bodies tired from the sun, we’d make our way indoors, the cold tiles of the living space floor welcoming us back. We’d all indulge in time alone on the property. Shaded hammocks, picnic tables behind the house and a covered sheep-skinned padded sitting area built into the hillside nearby became our respective offices. The surrounding environment is so serene and void of any city noises. Once the sun went down, the stars shone so vibrantly. We were hypnotized, clustered together in the driveway, noses pointed straight up to the sky. The land truly felt like an escape and the creativity began to flow effortlessly. We channeled this creativity into brainstorming sessions that took place each morning following breakfast in the living room of the main house. The tall ceilings and big windows captured the daylight as we scattered about, sitting cross-legged on the decorated rug, cozied up on the ever-inviting couch, or lounging in the more masculine armchairs opposite. We felt so at home amongst the fresh flowers, hanging art and collection of local artifacts that adorned the space. We had even snuck the Biomat in the corner of the room, the team mascot these days. Needless to say, we never wanted to leave! We spent our last evening on the property cooking a team meal of kitchari – the recipe from Julie Bernier of True Ayurveda is linked below. All of us together in the spacious kitchen, chopping, boiling, stirring and laughing. The kitchen housed many cooking essentials and with the fresh groceries we had picked up a few days prior, our meal was complete. 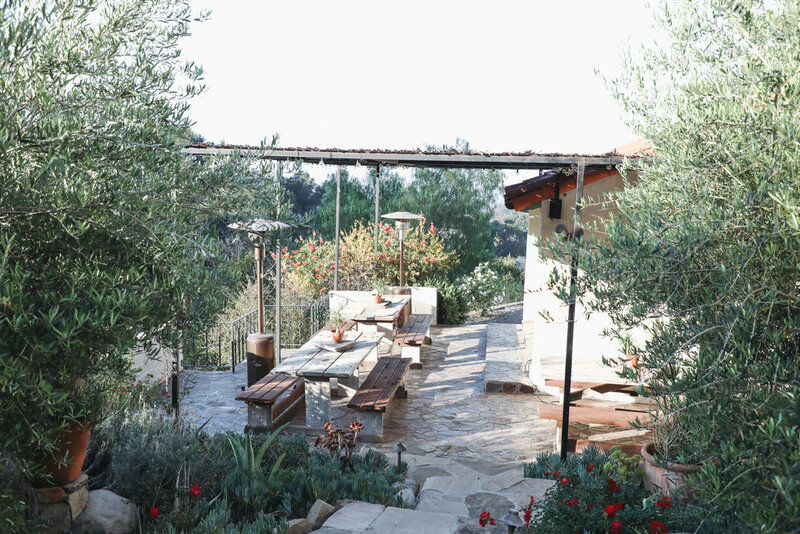 We enjoyed our feast outdoors in the back patio, seated around the picnic table while the sun set over the surrounding hillside, reminiscing about our beautiful Ojai experience. We couldn’t have conjured up a more perfect place to all come together for the first time, for our first Free and Native team retreat. Thank you, Ojai Vista Farm! i. Earthing • strip your feet of shoes and socks and find a patch of land to nestle into. Earthing brings us back to, well, earth! It’s a grounding practice that can help you feel more connected, energized and at ease. ii. Take a moment to explore • Get to know your surroundings. Stretch your legs and expand your lungs as you walk around your new abode to feel more at home. iii. Refresh in a body of water • The ocean, a lake, pool or even a bath can be a wonderful way to welcome yourself to a new environment. Keep an eye out for more to come as we share the details of our team retreat in Ojai.